I decided to use this adorable stamp from PSX Designs of the pick-up with the tree and wreath for the Holiday Pines challenge. 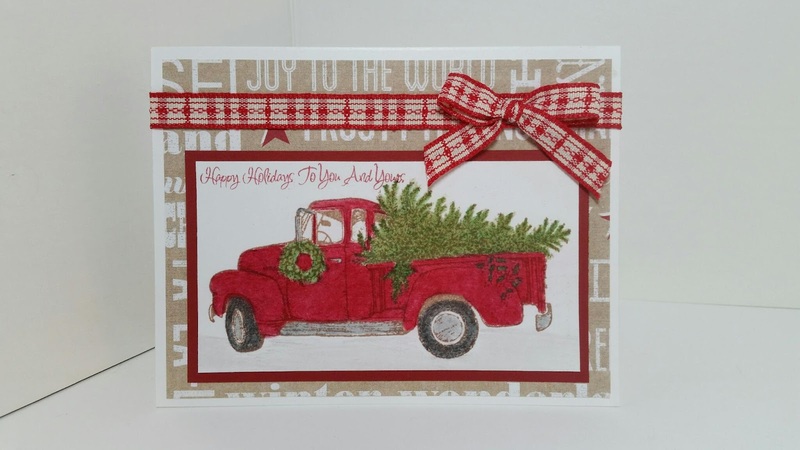 The card is a simple design with a ribbon and patterned papers for embellishment. The greeting reads, "Happy Holidays To You And Yours". I've always loved these images....wishing I had a pickup like this myself, although without power steering, I'd probably not be able to drive it, LOL! Love your coloring and the layout too! 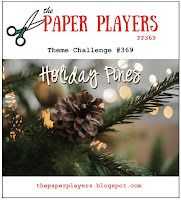 So happy that you shared this with us at the Paper Players and my Holiday Pines challenge! Such a sweet image and great coloring! The Kraft paper and plaid ribbon add to the rustic charm--thank you for joining us at The Paper Players! Hmmm... I am thinking I should decorate our truck! Beautiful card!! Thanks for playing with us at The Paper Players.